Algae has been used by tens of millions of people in Asia for over 50 years, and even Olympic athletes and NASA astronauts have relied on algae for decades as a way to pack a lot of nutrients into a very small volume of food, probably since algae contains 1,000 times more nutrition than anything else in the world (or if you'd like to think about it this way, one gram of algae – about the equivalent in a tiny tablet – contains the nutritional equivalent of 1,000 grams of fruits and vegetables). Fact is, you're missing out on a big nutritional hack if you're not eating some form of algae. So today, you're going to learn exactly how to find and use algae in your diet, and no, it does not involve sticking your head into fish tank and gulping down slimy green plants. Chlorella is a single-celled freshwater micro-algae that contains the highest known quality of chlorophyll found in a nature. Chlorophyll has a chemical structure very similar to hemoglobin, and because of these properties, it can carry oxygen around in the blood and increase your red blood cell count. There is even research that shows that a combination of chlorophyll in your bloodstream and exposure to sunlight can allow you to produce ATP without actually eating any calories. Compared to other commercial sources of chlorophyll like wheat grass, barley, and alfalfa (all popular ingredients in “greens” supplements), chlorella has five times more chlorophyll than wheat grass, twelve times more than barley and nearly ten times more than alfalfa. Because of it's extreme photosynthetic efficiency from the high levels of chlorophyll, chlorella is a very attractive potential food and energy source (it is also high in protein and other essential nutrients, and when dried, is about 45% protein, 20% fat, 20% carbohydrate, 5% fiber, and 10% minerals and vitamins). But that's not the whole story on chlorella. The indigestible cellulose of chlorella's cell wall can attract and bind with heavy metals such as lead, mercury and cadmium and help to remove them from your body. These natural detoxification properties mean that chlorella is a good way to reverse the damage from environmental pollutants and toxins found in many foods. In addition to leaching metals, chlorella can assist with the removal of hydrocarbon pesticides, herbicides and insecticides, and can also have protective effect on the liver, your body's valuable toxin filter. Now let's look at chlorella's close cousin: spirulina. Spirulina is also a microalgae, but it's actually higher than chlorella in protein content, at about 60% protein, with all the essential amino acids. Although spirulina's slightly reduced amounts of methionine, cysteine and lysine make it (or chlorella) not quite as complete a protein source as meat, eggs or milk, algae is still highly superior to any other plant protein, like legumes or grains. Spirulina is also about 7% lipid, and high in gamma-linolenic acid (GLA), along with other essential fatty acids, including eicosapentaenoic acid (EPA) and docosahexaenoic acid (DHA). For a vegan or vegetarian who doesn't eat fish, or has a hard time getting enough fats or proteins, this is really good news – an ocean chock full of what you need to keep your brain and nervous system from deteriorating. And spirulina is a rich source of vitamins, including vitamin B (but not B12, so you'll still need another source of that), vitamin C, vitamin D, vitamin E, and minerals like like potassium, calcium, chromium, copper, iron, magnesium, manganese, phosphorus, selenium, sodium and zinc. Compared to any other plant, spirulina also has the highest concentration of antioxidants in the world, the highest concentration of beta carotene in the world, is a great source of fuel for the good bacteria in your gut, and has the second highest concentration of omega 3 fatty acids (second only to mother's milk). On top of that, it has over 40 vitamins and minerals despite having only one calorie per serving. A small amount of spirulina not only increases physical energy and mental focus, but the nutrient density can replace the need for taking large amounts of other supplements, and both spirulina and chlorella algae sources are safe for children. Spirulina's high concentration of antioxidants and essential fatty acids contribute toheart and brain health, normalize blood pressure, correct anemia, normalize healthy cholesterol levels, and even reduce cancer risk. Most importantly, spirulina can do this without caffeine, sugar, chemicals or a prescription. The protein in spirulina contains eighteen of the twenty amino acids, including all eight essential amino acids your body can't produce, making it a complete protein. The aminos are unstructured, which means they are quickly and easily absorbed. Spirulina also boasts more beta carotene than carrots, more iron than spinach; more antioxidants than blueberries, more chlorophyll than liquid chlorophyll and has a nutritional profile that is almost identical to breastmilk, nature‚'s other perfect food. So even though chlorella is high in protein, spirulina is even higher in protein, and also an excellent dietary source for muscle recovery and repair, amino acids and fatty acids (especially if you're vegetarian or vegan and don't eat meats or have a hard time getting enough fats – which is why we think it's crazy that algae isn't discussed more in articles on vegan/vegetarian, senior and athlete nutrition. Even if you're drooling over the benefits of algae, you can't just go rushing to your local bargain supplements outlet or bulk foods website to grab just any old algae source. When it comes to algae, if you're serious about what you put into your body, the source matters. So here are 8 very important considerations for you if you don't want to waste money on a bunch of completely ineffective algae – you should read and follow these 8 tips if you don't want to do more harm than good to your body in the process of introducing algae into your diet. 1. Get certified, organic non-genetically modified (non GMO) algae. Purity is important with this stuff, and you don't want to be eating genetic mutants that have been dosed repeatedly in herbicides and pesticides. There is a wide variance in the quality of spirulina and chlorella algae. Not all algae is grown using the same level of quality control. 2. Don't get algae from spirulina and chlorella companies that put “fillers” in their algae. This means you would need 10-20 times the algae necessary to actually get a positive effect – and that amount with completely flip your stomach. Just get 100% pure spirulina and chlorella. Similarly, do not get chlorella or spirulina in any kind of gel cap, especially if you are vegetarian or vegan, since most of those gel caps are made from fish oil. In most cases, you have no idea what other fillers are in those gelatin capsules. 4. The country of origin where spirulina and chlorella are grown is very important. For example, many suppliers of spirulina in China have been found to falsify their paper work and claims about being organic (in fact, there are a lot of products that come out of China that are falsely certified). Yet a company that just wants to make sales will usually go with the cheapest suppliers – and often that means they are buying the algae from China. This is very dangerous because you really don't know what you are getting, and you could be harming your health more than helping your health if you buy cheaper spirulina or chlorella that was grown in China – and may in fact contain not only a high concentration of contaminants, but also a lower grade of algae. Made from 100% organicallly grown, NON GMO spirulina algae and loaded with 40 nutrients, ENERGYbits® algae tabs have the highest concentration of protein in the world (64%) all for just one calorie per tab. Spirulina has been endorsed by the United Nations and Olympic gold medalists for decades. Now it's your turn. 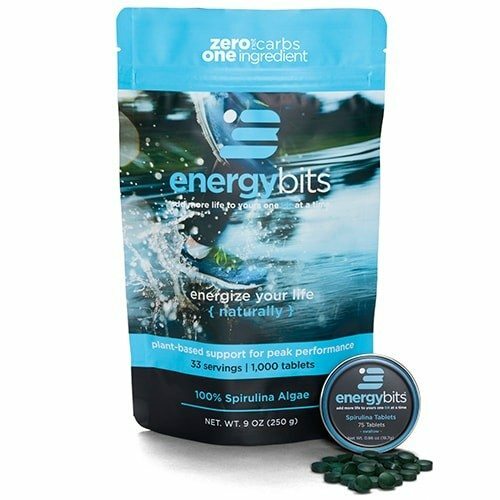 ENERGYbits® algae tabs are your answer for raw energy and health. All naturally too. With just one calorie per tab, ENERGYbits® will stop your cravings, slay your hunger and give you a steady stream of mental and physical energy all day or night. They may even make you want to leap over tall buildings in a single bound, but I think that's best left to the guys in the red capes and blue tights. Remarkably, ENERGYbits® have just one ingredient, spirulina algae which is a super hero in the world of super foods. Spirulina's nutritional pedigree is so impressive that The World Bank, NASA and Olympic athletes have all declared spirulina to be the most nutritious food in the entire world. Why? Well for starters, it effortlessly and naturally boosts your energy like an energy drink, energy bar or coffee but without the downside of chemicals, caffeine, calories, gluten or sugar. Gram per gram, there is no denser source of nutrition than spirulina algae. Click here to order now, and remember to use code BEN to save 10% on any product! RECOVERYbits® algae tabs are the most natural way to build your immune system RECOVERYbits® and aid your detox or cleanse by removing toxins naturally. They also help build your digestion, improve longevity and help reduce hangover symptoms. With all these benefits it's remarkable that RECOVERYbits® have just one ingredient – chlorella algae. Chlorella algae has been used in Asia for fifty years where it is prized for its many benefits. Carrying RECOVERYbits® with you is like having your own personal physician tucked in your handbag or back pocket. But since we've never seen a doctor that small, RECOVERYbits® are a more viable choice. In fact, many people in Japan take chlorella, not Vitamin C before they leave their house each morning. And for good reason, chlorella contains a vast number of vitamins and nutrients, including Vitamin C, ZInc and all the B vitamins. But in a nutritional “show down”, American Idol style, chlorella algae, would beat Vitamin C hands down due to its 60% protein and forty nutrients. You take a shower to clean the outside of your body every day. Right? Taking RECOVERYbits® every day is like giving your body a shower on the inside. This is because chlorella has a unique ability to pull toxins out of your cells and eliminate them. Taking chlorella daily can help remove the toxins that are in your food, water and air while also removing free radicals or lactic acid you generate from intense physical activity. Chlorella algae binds to all toxins (including alcohol in your bloodstream) and eliminates them from the body through natural means (elimination, urine, sweat, etc). It's pretty amazing what a tiny handful of little green tablets can do (and remember, both ENERGYbits® and RECOVERYbits® tablets are just one calorie per serving). Don't worry if you haven't heard about spirulina or chlorella algae yet. You will. Virtually unknown in America, they have been used for over fifty years by millions around the world to improve their energy.